Trace Evidence is an exhibition and a panel discussion at Minnesota Street Project, in partnership with SFMOMA Public Dialogue, in which the curators—2019 GUH Fellow Annie Malcolm and artist Rachelle Reichert—will convene visual artists from China and the U.S. who are considering issues of environmental change focused on China. Trace Evidence will take place in San Francisco in September 2018, during the Global Climate Action Summit, and is formally affiliated with GCAS. The curators are interested in interrogating the work of art as a platform for cross-cultural conversation about climate change. Annie Malcolm discusses the conception of the exhibition and its connection to her research on Chinese art villages. Americans gaze over to China and see the physical conditions produced by late capitalism magnified because of the scale and speed of development. China’s processes of industrialization and urbanization have degraded their environment in parallel fashion to US industrialization but, due to its rapid progress, they are uniquely perceptible. Thinking with Timothy Morton, we conceive of climate change as a hyperobject (Morton 2013): its entirety can never be seen, yet it affects everything. How are artists taking the visual elements of climate change, pollution, and extraction and making them accessible? How are artists trying to see this thing that is impossible to see but felt everyday? Climate change is a form of slow violence (Rob Nixon 2013), harming and displacing people, enacting violence at a slower speed than violence usually occurs; climate change forces the rethinking of timescales. The work we will show in this exhibition deals with these issues on different levels of directness. Some of the work offers the opportunity to meditate on the questions, think about scale, and be in a sensible relationship to place, landscape and environment; other works expose the viewer to the violence of extraction and the factors at work in climate change. By exhibiting both American and Chinese artists, this exhibition will look from the outside while addressing the area from within. Coming to Berkeley to start my Ph.D. in Anthropology in 2013, my plan was to study art worlds in Beijing. In 2015, however, after my experience in the GUH studio course Art + VIllage + City, taught by GUH professors Winnie Wong and Margaret Crawford, exploring Guangzhou and Shenzhen, I changed my field site to an art village outside Shenzhen. This came in part out of the arrival at Wutong Art Village, twenty minutes down the road from Dafen Village and yet seemingly a world away from Shenzhen’s rapid speed and intense industry. Wutong sits atop the Shenzhen Reservoir, Hong Kong’s water source, and is thus an ecological preserve site. Therefore, while the art there doesn’t sell at a scale like that of Dafen, a creative enclave is given space to thrive. Southern China has a unique history in relation to urbanism and experimentation, both with capitalism and aesthetics. The GUH course gave me a level of comfort with the studio visit form that I didn’t previously have; it taught me about presenting ideas visually, and about making research communicable through exhibition. Since I met artist Zhou Tao shortly after the GUH studio (who is one of the artists featured in Trace Evidence), I have wanted to show his work back home in the United States—his tender vision, acute methods of processing what he sees as pressing issues of our time and his creation of visual art that is cutting and human, abstract and accessible, bleak and beautiful. Trace Evidence is that desire realized, and with the added excitement of working in affiliation with GCAS to bring art and climate change into conversation. Rachelle Reichert creates graphite drawings and sculptures inspired by research of Chinese graphite mines, the source of graphite used in her artworks. The drawings depict abstract shapes from up-to-date satellite images of the mines. Working the graphite to reveal its material capacities through the visual language of abstraction, she explores the cost of green technologies and industries. Annie Malcolm is a sociocultural anthropologist whose work explores how Chinese artists respond to environmental and urban change. Currently writing an ethnographic monograph about art villages in outer Beijing and Shenzhen, she has worked in China over the last five years in research, installation, and translation capacities. Malcolm is a 2019 GUH Fellow and participant in the 2015 studio course Art + Village + City, for which was also the director for the satellite exhibition at the Shanghai biennale. She was also editorial assistant for the 2015 GUH sponsored journal P[art]icipatory Urbanisms, as well as a contributor to the GUH Special Issue of Room One Thousand Urban Pilgrimage. Malcolm is grateful for GUH’s support on this project. Morton, Timothy. 2013. Hyperobjects: Philosophy and Ecology After the End of the World. Minneapolis: University of Minnesota Press. Nixon, Rob. 2013. Slow Violence and the Environmentalism of the Poor. Cambridge: Harvard University Press. 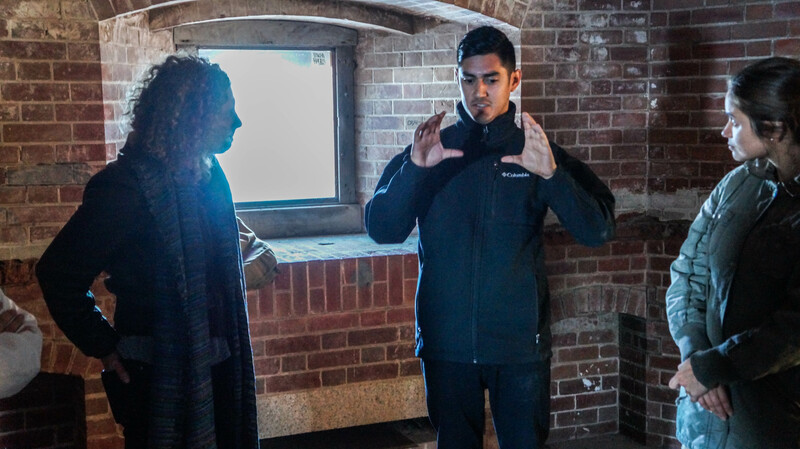 On Saturday, February 27, Ava Roy, Artistic Director of the We Players site-integrated theater group led students in a workshop at the foot of the Golden Gate Bridge to learn methods of using movement and bodily awareness to investigate public spaces. For a complete description of the workshop, which was sponsored by the Global Urban Humanities Initiative, and other experiments in dance and architecture, see this blogpost. My recent fascination with Lawrence Halprin's design process and the development of my studio design is what brought me to Ava Roy's workshop. In studio, I have become increasingly interested in how landscape design can not only benefit places ecologically, but also how it can create a theatrical stage for people in civic spaces to perform at all scales, from concerts and protests to the stand alone street performers. It seemed like a perfect match! However, I was still uncertain of what to expect, as I am new to the field of making spaces and even newer to the world of performing arts. 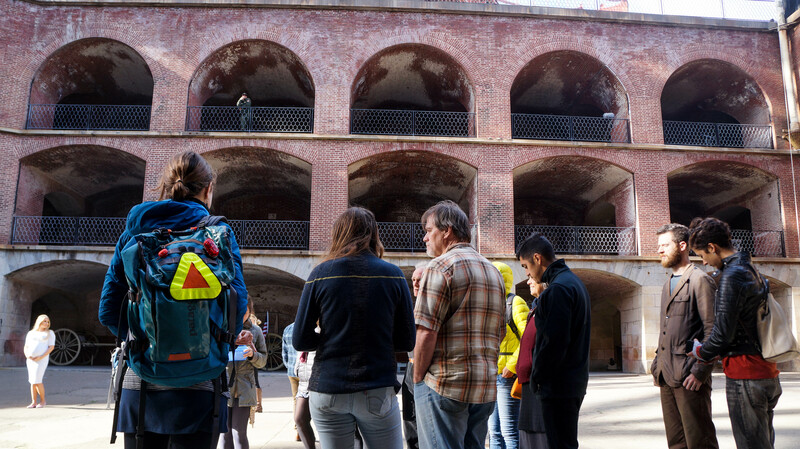 In any case, the workshop did give me a great excuse to visit Fort Point, which is an incredible site. From the beginning, I felt at ease with Ava. She did not start with lecturing us or even giving us context. She began with awakening our senses by asking us to close our eyes for just a few minutes and allow the other senses to take hold. What do we hear in the distance? What do we hear at our feet? How does that make you feel? I almost immediately entered a calming, meditative state. It reminded me of practicing yoga, which helps to relieve the stresses of my day and ground me in my senses, which are often blurred with all the other noise of the day. The exercises continued throughout the workshop and helped with bringing the group together and bringing meaning to the place. It was an effective tool to shut out the outside world and bring yourself to be with the space and notice things that would otherwise be hidden at first glance. It is often that we find ourselves glaring at our phones, listening to our headphones, browsing social media, or performing other daily rituals that allow us to be unaware of our surroundings. And thinking in terms of design, it presents a major problem because it is very difficult to make people stop and take notice. However, the series of exercises I just underwent revealed the space in a way that I would not have captured otherwise. Can I use these exercises in my site analysis? It seemed clear that they can be another set of tools to make sense of the current state of the site. This kind of practice can reveal the awful noise of a site but it can also shed light on the uniqueness or beauty of a site. This is where one can harness, for example, a faint pleasant noise and bring it to the surface to contribute to a more complete design. The research studio paired up in teams and produced 7 short videos depicting a “Chinese” site. These sites were the Pacific East Mall in El Cerrito, Oakland’s Chinatown, San Francisco’s Chinatown, and two dollar-stores in the Mission and West Oakland. The films produced were markedly different in style, pace, content, and scope, prompting the class to reflect upon the elasticity of a site’s users, boundaries, activities, objects, everyday life, and emotional qualities. Steen presented research from her project “Creative Class Civil Wars,” which explores the ways our concepts of creativity are shifting to exclude those in the arts. Shannon Steen’s recent talk, Creative Class Civil Wars: Displacement and the Arts in the Bay Area, situated the broad question of how US cities are changing economically in a discussion that touched upon my own studies of technology and culture at the School of Information. Steen used Richard Florida’s notion of the “rising creative class” as the focal point of an examination of the state of art and artists, and the shrinking support of the infrastructure that sustains their work and enlivens our American cities. Florida propounds the rising creative class as the solution to struggling cities, perhaps the most recent in a line of silver bullet strategies for urban renewal, as a commenter aptly pointed out in the discussion following Steen’s talk. Though the “creative class” sounds like artists of all stripes, Florida’s analysis leans away from the (struggling) thespian, painter, poet or muralist, and towards the oft-lauded tech worker. Many cities have created favorable conditions to usher in this tech worker, his company, and his future startup. Some of the I School curriculum is designed to funnel more workers, albeit thoughtful and informed ones, directly into Florida's creative class. In effect, Florida drops the actual artist from said creative class. What he offers instead is an ode to the tech workers, the “productive” creative class that brings innovation, “disruption,” and infallible youth. Particularly interesting was Steen’s guidance through the history of creativity as a notion in Western culture, and its move from the exclusive domain of God to that of the Renaissance artist, the elitism of artist as distinct from artisan in the 19th Century, to the scientific study and intentional propagation of creativity in children in the modern era, which saw the beginning of the removal of the artist from her authoritative position on creativity. Steen’s talk brought into relief the fact that the current notion of creativity, like many other commodities in US culture, is something we think we can manufacture on demand, and something that we can grow, as if in a Petri dish, if only we arrange the right conditions for it. Many use the existence and bustling churn of Silicon Valley to evidence the fact that indeed, creativity is being pumped out by the hundreds of startups and apps and interfaces. From an April Fool’s Day action by activist group Heart of the City and artist/interventionist Leslie Dreyer of Google bus action fame. 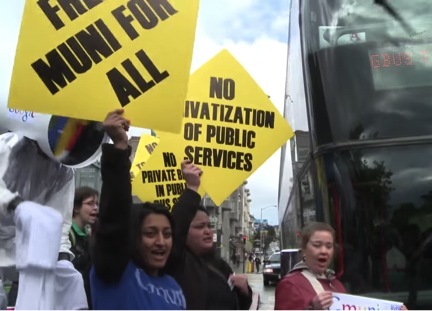 Activists blocked buses and announced that a new service, GMuni, would be offering free transit for all. However, this is all taking place at the risk of the heart and soul of our cities, and artists themselves. As “old-fashioned” creatives like playwrights, poets, writers, potters, sculptors, and their ilk are forced to resort to Indiegogo and other crowd-sourced funding strategies for one-off projects, their ability to thrive and produce art in the city withers. Meanwhile, the tech companies that are operating in the physical world are raising skepticism that this kind of “innovation” is at all good for San Francisco. On the contrary, it has spawned (some) companies that are capitalizing on public goods, sometimes with unabashed greed and opportunism. After Steen’s talk, I wondered how the burgeoning tech worker community might put some of their high incomes towards strengthening the arts in our cities. Although I’m skeptical that the problem would be solved by the very forces that have caused it, it would be interesting to challenge the Valley to produce a startup that makes the crowd-sourced funding of arts infrastructure extremely easy, fun, and hip. Steen’s talk drove home the fact that there’s a direct interplay between the elements that make San Francisco and its surrounding cities the place to be, and those that forewarn its decline. Those of us at the I School have the responsibility to double-down on our efforts to be thoughtful and discerning in our contributions to innovative technologies, and tread lightly in a city that was made cool long before we came on the scene. Given a recent article by Carlos Bueno in Quartz from which the quotes at the top of this post were drawn, the tech worker culture of Silicon Valley has tended towards insularity and in-crowd behaviors. I can’t think of a better antidote to such insular clique-ishness than a thriving and protected arts culture in the Bay Area. Robyn Perry is a candidate for the Master of Information and Management Systems degree at the UC Berkeley School of Information. Shannon Steen’s presentation about the shifting role the term “creative” has had over the years provided a fascinating glimpse at the power of words to define and redefine populations, and their respective perceived value to the city and its rulers. Specifically, she carefully demonstrated how Richard Florida’s famous invocation of the “creative class” of liberated and affluent workers in his eponymous 1991 book has been used carelessly by planners, politicians, and journalists to describe a multitude of people, often highly fragmented by more traditional class and identity categories. Specifically, the difference in lifestyle and worldview between a poet and a programmer can be a much bigger wedge than the common educational background the two may share, or the fact that both rely on crafting “new forms” (a fairly durable definition of creativity) on relatively flexible work schedules to support themselves. Recently, the most vivid skirmish in the creative civil war has been related to an astronomical rise in the cost of living in the Bay Area, particularly in San Francisco, along with the fastest rise in income inequality in the country. One question comes to mind as I read about the latest unbelievable price statistics, or the rise of Ellis Act evictions, or the people struggling to get by on fixed incomes: haven’t we been here before? Some of the stories could have been copied and pasted from 1998, swapping Pets.com and Webvan for Uber and Airbnb. 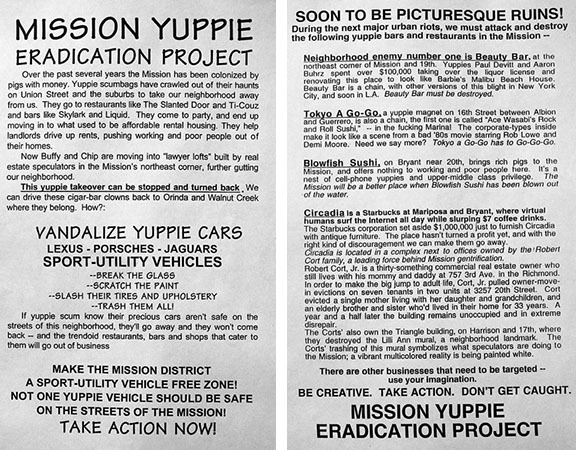 Not having lived through the first boom, one of the most striking differences I’ve seen through accounts of the earlier boom and bust is the earlier focus on radical action against property, exemplified by the Mission Yuppie Eradication Project of the late 1990s. See the posters below for an example of the kind of tactics they advocated, and their extremely specific target businesses (3/4 of the businesses are still around, although Circadia is just a regular Starbucks now, around the corner from KQED’s main office). While the group seems to have been a fairly small, violent segment of a broader movement criticizing Web 1.0 excess in a city full of exclusive parties and double-parked SUVs, I haven't seen anything this radical emerge in reaction to today’s crisis. Maybe the fleet of private buses ferrying commuters down to Silicon Valley is too massive a target, too perfect a metaphor for today's two-tiered economy, creating a handful of gold-plated jobs and a sea of intermittent gigs. Perhaps the most vocal critics of the yuppiefication of San Francisco made their way to greener pastures during the first boom, and what we’re left with is only a shadow of the activist Left who used to call the city home. Maybe the Bay Area’s much-vaunted food culture has been internalized to the point where rock star chefs feel more like creative class allies than mere gentrifiers. Maybe the impact of a decade and a half of slow-boil warfare and economic anxiety has limited the capacity of radical activists and allies to strike out too strongly at today's Crockers and Huntingtons, or the symbols of their wealth and status littering the city. Or maybe the creatives today on both sides of the civil war are just content to wage their battles with words, symbols, and social choreography (sometimes literally, in the case of some of the Google Bus protests), instead of the blunter instruments of bygone days. Disclaimer: This post is a speculation on the history of anti-gentrification activism in San Francisco, not an endorsement of any particular method of protest, especially violent ones. If you feel the need for physical protest against urban space, may I suggest yarn? If you’re fighting eviction or want to help people who are, considering joining and supporting the San Francisco Tenants Union. Will Payne is a Ph.D. Candidate in the Department of Geography at UC Berkeley. As part of the Global Urban Humanities Initiative Colloquium called Reading Cities, Sensing Cities, we have asked students and visitors to write responses to each of the weekly guest lectures. On September 4, 2014, Darin Jensen invited listeners to consider the narrative and spatial aspects of two experiential mapping projects he created with his students: Mission Possible: A Neighborhood Atlas about San Francisco's Mission District, and Intranational International Boulevard about Oakland. Jensen is staff cartographer and lecturer in the UC Berkeley Department of Geography. Video of the first portion of his presentation is available here. While not explicitly framed as such, it’s great to see the possibilities of Psychogeography dusted off and road-tested in the Bay Area. Under the leadership of Darin Jensen, UC Berkeley’s Cartography and GIS Education Lab (CAGE) digs in to explore the complex intersections of the physical and observational worlds. The resulting collection of mappings shows spontaneity and graphic savvy, but looking into the territories chosen for exploration provides us more questions than answers. 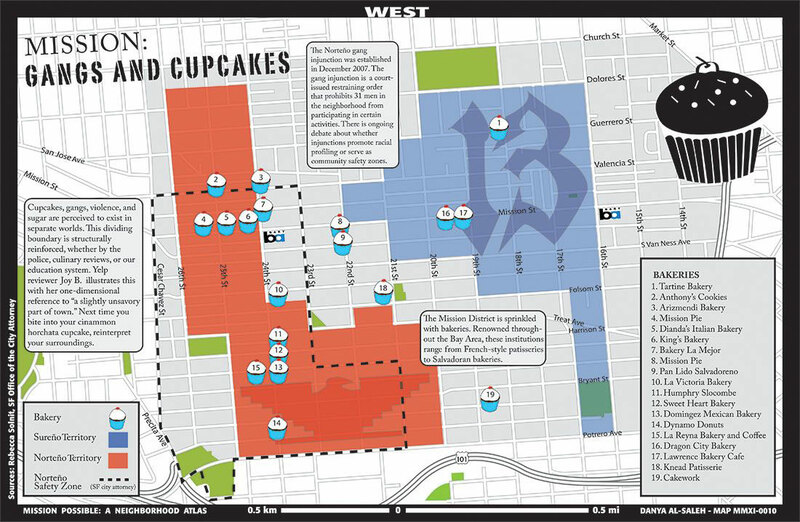 One project, already complete, zeros in on San Francisco’s complex Mission District CAGE Lab teams up with Mission Local, a district-based news site, to create a 22-map “Atlas” and illuminating a variety of slightly absurd but suggestive juxtapositions. 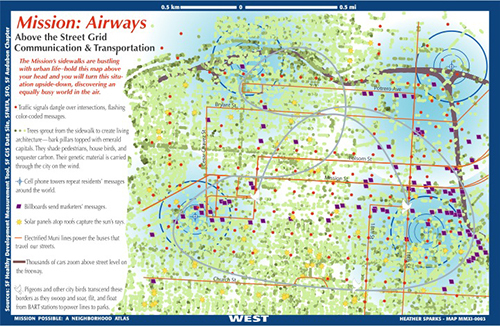 Each map tells a story through cartographic creativity, rather than text. Mapped gourmet coffee prices vs. depleting Latino neighborhoods, cupcake bakeries vs. reported gang activities, households with children vs. house-pet infrastructure (shops, kennels, parks)…these all provide suggestions of the frictions at work in the district, and often by comparing retail trends to demographics. An upcoming CAGE Lab project will focus similar scrutiny on a linear territory, Oakland’s International Boulevard, in advance of sweeping changes about to emerge from the planning pipeline. In both SF and Oakland projects, the underlying “story” often flirts with themes of gentrification. It’s important to note, though, that these map-based examinations are being requested and performed as gentrification-related dynamics swell, not plateau or recede. This raises the question of whether the creation and distribution of these map/stories constitutes just an observation, or whether they in fact abate or propagate the territorial shiftings identified. A question from the audience suggested that the factors chosen for mapping on International Boulevard seemed to lean towards the “institutional," rather than perhaps looking at more mobile and elusive district factors such as prostitution. This insinuates that such mapping might have a bias toward the more fixed and permanent components of life. The subtle possibilities of what this bias might catalyze, however subtly, is worth considering and, given the exploratory nature of CAGE Lab, fully open to question. Another question from the audience raised the topic of mapping data derived from charge card usage or cell phone use/location. This rich and emerging source might of course yield new avenues of cartographic creativity, especially relevant here in the San Francisco Bay Area. Scott Elder is a PhD candidate in the UC Berkeley Department of Landscape Architecture and Environmental Planning. Maps have always fascinated me, and as a graduate student in the department of Landscape Architecture I find myself looking at maps all the time as a source of information. My perception of maps was that they are an objective tool that gives us accurate information. Sitting in Darin Jensen’s lecture inspired me to look at maps in a different way – as storytelling devices. Just the fact that most maps orient to the north is a conception that says something about the story a map is trying to convey. Darin refers to maps as storytelling devices where the cartographer brings in his own emotion and personal experience. Maps convey a complicated story in a certain moment in time, and the reader of the map can enter that story wherever he chooses. So in that perspective, each person creates a different story from the map, depending on the things he noticed first and the things he put an emphasis on. The project of Mission Possible that Darin and his students did, where they mapped different things in the Mission District in San Francisco, was very inspiring. The ideas that they had about what and how to map in order to tell a story of a neighborhood got me thinking about the information which surrounds us all the time--information that when put on a map can really manufacture the story of a place. Yael Hadar is a graduate student in the UC Berkeley Department of Landscape Architecture and Environmental Planning.